In just four words—“the capital of everything”—Duke Ellington captured Manhattan during one of the most exciting and celebrated eras in our history: the Jazz Age. 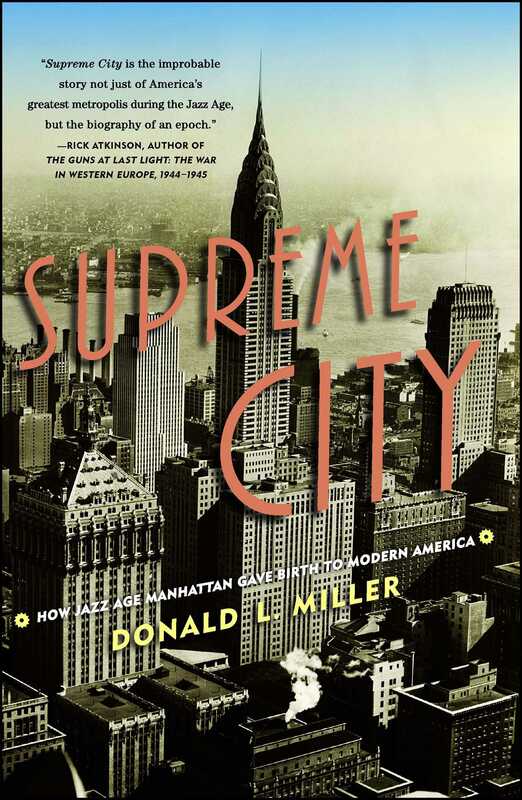 Supreme City is the story of Manhattan’s growth and transformation in the 1920s and the brilliant people behind it. Nearly all of the makers of modern Manhattan came from elsewhere: Walter Chrysler from the Kansas prairie; entertainment entrepreneur Florenz Ziegfeld from Chicago. William Paley, founder of the CBS radio network, was from Philadelphia, while his rival David Sarnoff, founder of NBC, was a Russian immigrant. Cosmetics queen Elizabeth Arden was Canadian and her rival, Helena Rubinstein, Polish. All of them had in common vaulting ambition and a desire to fulfill their dreams in New York. As mass communication emerged, the city moved from downtown to midtown through a series of engineering triumphs—Grand Central Terminal and the new and newly chic Park Avenue it created, the Holland Tunnel, and the modern skyscraper. In less than ten years Manhattan became the social, cultural, and commercial hub of the country. The 1920s was the Age of Jazz—and the Age of Ambition.